Birkenstock is a brand name for shoes. But the name itself embodied so much with the model of summer slippers and sandals that has become the common name of these shoes. The history of the real shoes of Birkenstock brand is pretty funny. At first, these are German orthopedic shoes, which today are recognizable sign for valuable fashion. Ultra-modern and extravagant – these are today these whimsical slippers and sandals. Sandals with soft orthopedic insole are the peak of its popularity in fashion of 90s, thanks to the interest from musicians and stylists. In 2002 came another fashion peak of this model, when Gwyneth Paltrow makes a walk through the streets of London, wearing Birkenstock. This increases the demand for these exclusive models in all world capitals. Today the demand is again immensely and these sandals are produced in different colors, from different materials, even and for the winter. 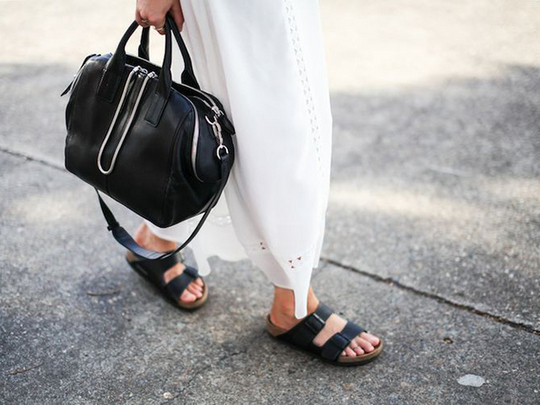 Known and loved by many people of this model are the modern Birkenstock of Celine, which have fur on the soles. Thus they become bold bizarre accent in winter style. Besides Celine, other fashion houses also noted his interpretation of character model.These are Givenchy, JW Anderson, Helmut Lang, Delpozo, Jil Sander, MSGM, Calvin Klein, Marc Jacobs. Brands like Tommy Hilfiger, Trussardi offers to combine Birkenstock with swim suits for the summer, as demonstrating bold combinations with blouses and shorts. Marni in his summer collection shows original variant of Birkenstock with massive platform in Geisha’s shoes style. Fact is that Birkenstock are so comfortable, that can equally fit well in the style as for the city and for the beach. They can be perfectly combined with all kinds of clothes, even and with costume. Perfect combination of this Birkenstock even with swim-suit.